Congressional incumbents in Maryland are crushing their challengers in the crucial fundraising contest, except in the highly competitive 6th Congressional District, according to the latest campaign finance reports. In the other seven Maryland districts, six Democrats and one Republican have outraised even well-known challengers by figures ranging from 5 to 1 to 400 to 1, based on third-quarter reports filed this week. In the key figure of cash on hand for the five-week run-up to the general election, the incumbents’ margins are even greater. Reports are incomplete in the U.S. Senate race, but based on unofficial statements from his challengers, Democratic U.S. Sen. Ben Cardin is still $2 million ahead, having raised $6.5 million, even though independent Rob Sobhani has ploughed in $4.4 million of his own money. Republican Dan Bongino has raised more than $1.1 million. 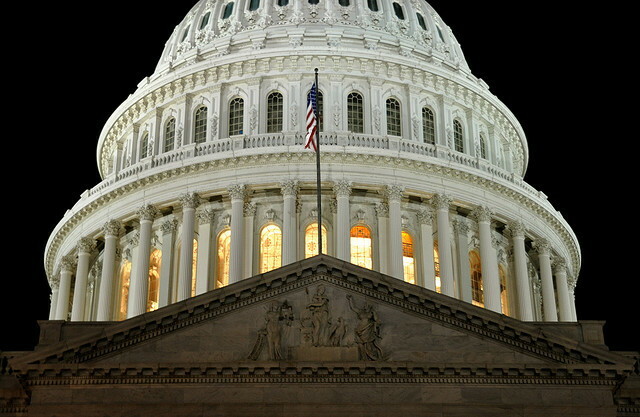 The figures were compiled by the Center for Responsive Politics based on reports filed with the Federal Election Commission. The center’s charts make the numbers easier to compare, and contain links to more detailed accounting and other information for each candidate. Only in the 6th Congressional District, where Democrat John Delaney is trying to bump off 10-term incumbent Republican Roscoe Bartlett, has the challenger raised more than the incumbent. That is not even counting the $1.8 million of his own money that Delaney, a wealthy commercial banker, put into the race to help him win the primary. So far, aside from his own loans to the campaign, Delaney has raised more than $1.6 million from mostly large contributors. This doesn’t include a fundraiser this week with President Bill Clinton. Bartlett has raised less than $1.1 million and getting no help from national Republican sources. Bartlett’s Western Maryland district was deliberately redrawn last year to add hundreds of thousands of Montgomery County Democrats and remove a similar number of reliably Republican voters in Frederick and Carroll counties. Both Delaney and Bartlett have more than $200,000 left. Other incumbents have no such worries, even though Rep. Chris Van Hollen in the 8th District and Rep. Donna Edwards in the 4th were given thousands of new and more conservative voters than the two Democrats would have preferred. Van Hollen outraised Republican Ken Timmerman $1.3 million to $160,000, in a district that stretches from Silver Spring to the Pennsylvania border. Van Hollen, former chairman of the Democratic Congressional Campaign Committee, has a whopping $2.3 million in cash on hand, including money from his last campaign, compared to just $58,000 for Timmerman, a journalist and author on the Middle East. Edwards raised $727,000, 10 times as much as the $71,000 Republican Faith Loudon, a career homemaker, brought in. Edwards has $108,000 in cash, and Loudon $31,000 to run in a district that includes half of Prince George’s County and parts of Anne Arundel stretching to Severna Park. In Southern Maryland’s 5th district, U.S. House Minority Whip Steny Hoyer has raised $3.8 million to the $128,000 brought in by Maryland House Minority Leader Tony O’Donnell. 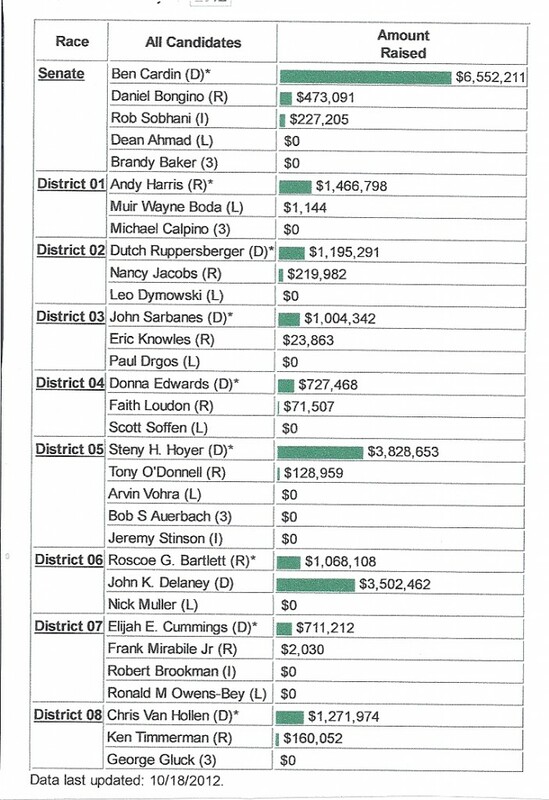 Hoyer has given $1.5 million to other Democratic candidates for Congress, but still has $1.5 million cash on hand. O’Donnell has $45,000 on hand. Hoyer has refused to appear jointly in any forum or debate with O’Donnell. Republican Rep. Andy Harris, who has raised $1.4 million, has also refused to debate the opponents he has left. Democrat Wendy Rosen, who had raised $151,000 for her campaign, was forced to withdraw from the race by her party when it was found she voted in Florida and Maryland in the same election. But Rosen’s name is still on the ballot. The Maryland Democratic Party is pushing John LaFerla as a write-in candidate, and protesting Harris’s disregard of an opponent whose name won’t appear on the ballot in a district deliberately drawn to pack in the Republicans from Eastern Shore, Harford and Baltimore counties. Harris has $673,000 cash on hand and LaFerla has $6,500 remaining, out of the $151,000 he raised for the primary race he lost to Rosen. State Sen. Nancy Jacobs, a Harford County Republican, raised the most of any challenger after Delaney. She brought in $220,000 in her race against Democratic U.S. Rep. Dutch Ruppersberger, who raised $1.2 million, with $954,000 left, almost 15 times the $65,000 Jacobs has on hand. In the 3rd Congressional District, incumbent Democrat John Sarbanes raised $1 million to the $23,000 for Republican Eric Knowles. In the 7th District, Rep. Elijah Cummings raised $711,000 in the past two years, but still has $800,000 on hand compared to just $2,000 for Republican Frank Mirabile. All three non-partisan national political analysts – Rothenberg, Cook and Sabato – now say that the 6th district will likely go for challenger Delaney, but they all predict safe sailing for the other incumbents. The latest campaign finance figures seem to confirm those assessments of the incumbents’ advantage.